After breakfast, we walked over to Musee D’Orsay which was not too far from our hotel. We arrived shortly after opening and were in quickly with our Paris Museum passes. This museum was much more manageable than the Louvre both in size and flow. It houses a lot of great paintings by the impressionists including Monet, Degas, and Van Gogh. I found this museum much more accessible as someone not as involved with the visual arts. We spent about 3 hours at this museum. Next, we walked along the Seine to Ile de la Cite. It was a longish walk but plenty to see along the way with street vendors all along the river bank. 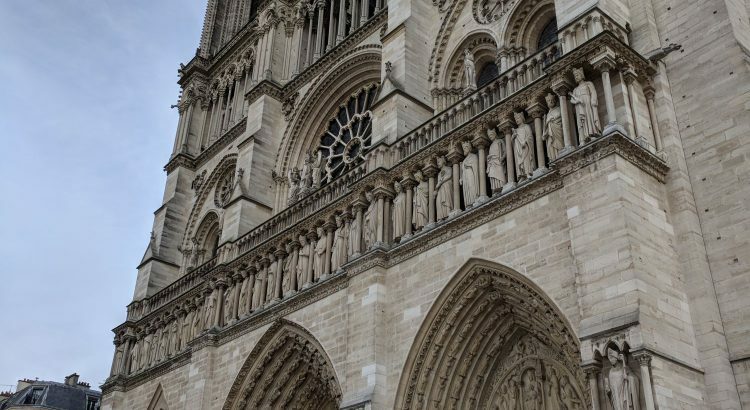 We found a place to pick up sandwiches along the way and then continued walking to Notre Dame. After a little bit of a wait, we were inside and we walked around the Gothic cathedral. Mass was going on so it was interesting to hear the organ and bells during the service. It did seem like the constant parade of tourists walking around the cathedral would be quite distracting and disruptive though. Next we wanted to climb the towers of Notre Dame. You have to register for tickets for a specific time either on the kiosk or with an app. We got very lucky and there were a few tickets for exactly when we were there. Otherwise, the next tickets were not for 3-4 hours. It might also be that they release tickets for no-shows, so you might be able to scoop some up if you hang around the kiosk. There were some very narrow and steep circular stairs so not the best for claustrophobic people. The views were great from the top. Close by on Ile de la Cite was Sainte Chapelle which was also included on our museum pass. We had to wait in line for a bit to get in but it was not too bad. This is a chapel made entirely of stained glass. It was very beautiful and also fun to try to pick out biblical stories depicted in the windows. This was a very quick visit, about 30 minutes, and there really is not anything to do besides admire the chapel. To finish out the day, we took the Metro over to Musee d’larmee and Napoleon’s Tomb. There are several different parts to this museum covering nearly all of French military history. You can get into any of the sections with the museum pass. We saw the extremely ostentatious tomb of Napoleon which was totally not compensating for anything. We also walked through the World Wars exhibit which I thought was extremely well done. There are about 5 other exhibits here of French military history and you easily could spend a half a day here if you are interested in history. The museum was closing soon so did not have a ton of time here to explore. After heading back to the hotel for tea time and resting, we went back out to get dinner at Bistro des Victories. This was your classic French bistro with tables jammed up against one another and very busy. I had the roasted chicken with mashed potatoes and Samantha had the duck confit with salad and potatoes. For dessert, we split a creme brule. All the food was very tasty and extremely reasonable by Paris standards.